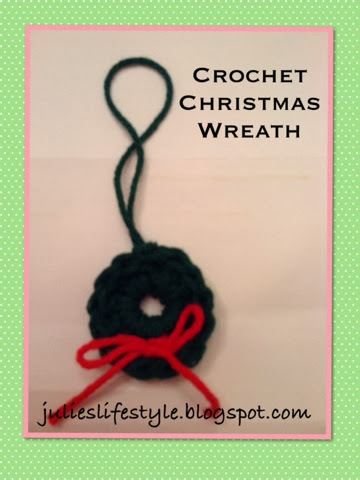 I have been busy crocheting mini wreath ornaments for family and friends for Christmas this year. This is a simple ornament pattern that I designed and would love to share with you. Won't these look great on your Christmas Tree? You can even use them to go along with a gift tag on a present. You can have these made in no time and they are fun to make. For this pattern I used kitchen cotton, but you could use acrylic yarn if you like or have on hand. Chain 5, slip stitch to make a ring. Chain 3 and make 12 double crochet in ring. Slip stitch to end of top of the 3 chain. Make a loop and tie a knot to end. Take red yarn and cut 9 inches long to make a bow at bottom of wreath. 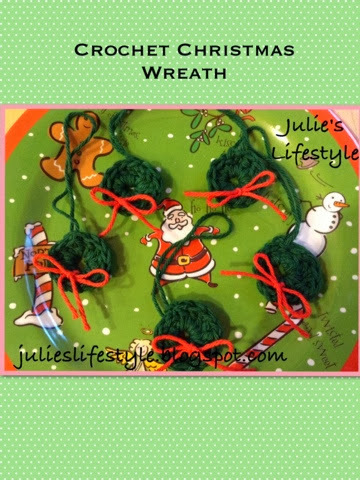 I hope I have inspired you to make this fun mini wreath ornament for Christmas. Those are cute, easy and perfectly wonderful for the holiday season. Thank you for linking to Super Sunday Sync. These are sooo cute Julie! The ones you sent me are on my tree now, and they look totally adorable. Thanks again! You always come up with the cutest projects Julie, and you're truly very talented! I'm sure whomever receives these cute little wreaths will treasure them. These are so adorable, Julie! I love them and would make them if I knew how to crochet :) Also, I LOVE the chunky knit scarf - so cute! I hope you are well, friend. Hugs! I wish I knew how to crochet because these are soo cute. Thanks for linking up with us at Share Your Stuff Tuesday. So cute!! Thank you for networking with us on the CLIMB! What a cute project. I haven't done any crochet lately but I love small things like this to make! Thanks for sharing my friend! You always have something pretty for every season! Hugs! They are so lovely Julie! I really need to start crocheting again! Have a wonderful weekend. Very beautiful, Happy Week-end !!! So Cute!! Thanks so much for stopping by all the time!! I really appreciate it!! I am playing catch up.. I love fun, quick little projects like this. Thanks! Ohh, I could do these with the kids at work. Soo easy. Thanks for linking up with us. Hi Julie! Love your little wreath ornaments. I like quick little projects like that. Have a wonderful weekend! Julie, these are adorable and I can see how pretty they would look on the Christmas tree, draped over a spindle of a chair or even hanging from door handles! Thanks for sharing the fun! So cute Julie! These little wreaths have such a vintage feel about them! Thanks for sharing with SYC and also our 'Creating Christmas' party! Thanks for joining the party! Cute little wreaths! love it :) Perfectly wonderful for decorating just about anything - tree, office cube, wreath, garland, presents - and more! Thanks for linking to Snickerdoodle Sunday! Adorable. I love homemade ornaments. This makes me wish I could crochet.